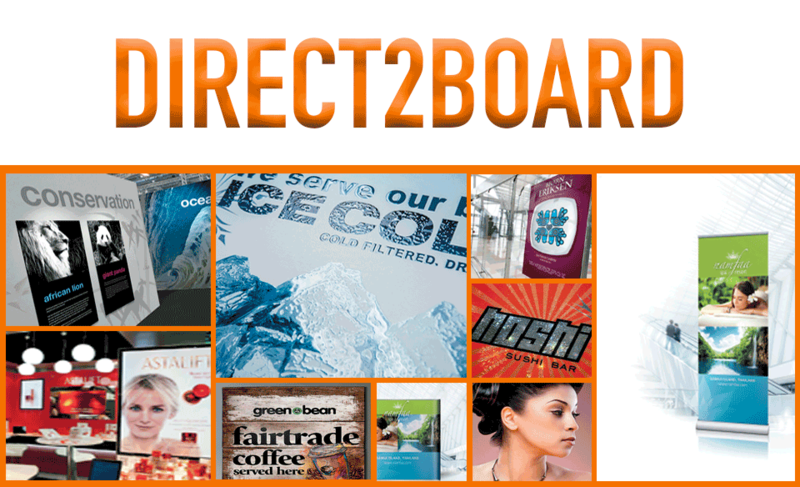 What is DIRECT2BOARD Large Format Printing? DIRECT2BOARD Large Format Printing is the ability to print directly onto large surfaces up to 2 inches thick. The types of surfaces (or substrates) could include wood, aluminum, foam core, acrylic, transparent film, magnetic material, corrugated board, PVC and much more. With older technology, that was not possible. The print had to be done on a paper substrate then glued onto a surface. Today, we can print directly onto surfaces up to 4’ x 8’. Read more HERE. Why Use DIRECT2BOARD Large Format Printing? Digital marketing may be the most talked about marketing strategy these days, however, prospects and customers still value and respond to printed materials. Messages on large format printed posters, banners, signs, and window clings are easier to remember than online messages that bombard us daily, which we’ve all learned to ignore. With DIRECT2BOARD Large Format Printing, you can ensure your messages will capture a customer in real-time. BIG is hard to ignore and will be remembered. If a potential customer doesn’t make it through your storefront door initially, seeing a banner or sign multiple times in passing can often inspire someone to walk into your business. 68% of consumers believe a store’s signage is reflective of the quality of its products or services. 76% of consumers report walking into a store they never visited before because a sign caught their interest. 68% of consumers reported purchasing a product because a sign caught their eye. 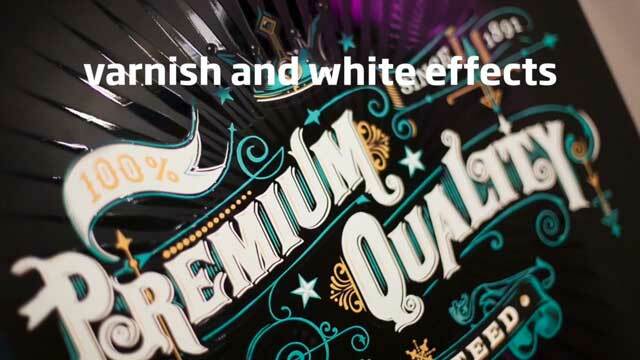 What Are The Benefits Of DIRECT2BOARD Large Format Printing? DIRECT2BOARD Large Format Printing is hard to ignore, it shouts “look at me.” It’s big and bold, and it builds brands. Foot traffic can generate real customer engagement with your products, that’s not possible with social media. It’s versatile. 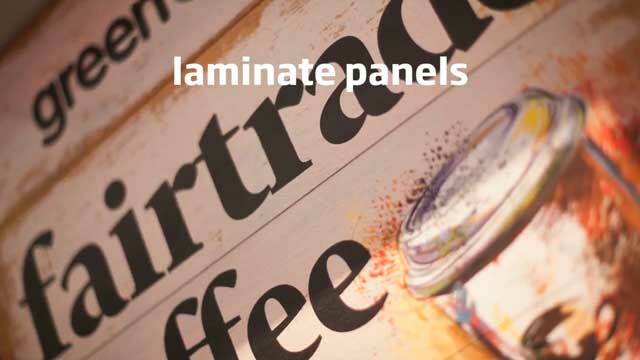 DIRECT2BOARD Large Format Printing can be applied to all types materials – wood, foam core, fabrics, polyurethane, vinyl, adhesive decals, PVC and much more. This opens up a variety of places to put your message, like floors, doors, ceilings, walls, windows, and on building exteriors. It’s cost effective. For a smaller business, creating a large format ad or marketing piece may seem out of reach because of up-front costs. With the right content and location a banner, billboard, sign, or window cling could easily pay for itself. It allows your business to brand space quickly and affordably. 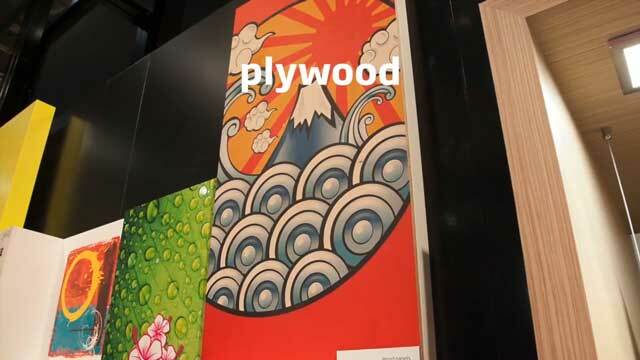 Watch our video to see what’s possible with DIRECT2BOARD Large Format Printing! How Can I Use DIRECT2BOARD Large Format Printing For My Business? Banners and signs continue to reinforce your company’s name and brand each time they’re seen. They draw customers into your store. If placed in high-traffic areas, they may reach the same customer multiples times a day. A well designed sign generates impulse buys. Studies have shown that people read and remember what’s on a sign. When store specials are displayed, sales increase within the store. Potential customers who’re busy and don’t plan to visit your store, might notice your sign and realize they want something you may have, and will come inside. If your sign grabs their attention vs others, you’ll be the one who gets their business first. Directional signage is mandatory for large locales like shopping malls, hospitals, schools, public places, or corporations. With directional signage, people are less likely to get lost which helps avoid a situation that could reflect badly on you. Directional signage can also be useful for large scale outdoor events such as festivals, fairs, or places where there are multiple buildings or entrances. Unlike broadcast marketing, where commercials grow old soon after being aired, banner advertising prolongs its purpose of exposure. Each time a customer sees your banner, your business is reinforced. People don’t get bored seeing the same banner, but they do get bored seeing the same TV commercial over and over again. Banners are great for announcing special events like sports tournaments, community events, parades, fundraisers, craft fairs, or yard sales. Banners can be reused year after year. With good planning, banner ads for special store promotions or holiday sales can be displayed as needed, then put into storage until next time. Just omit specific dates and you’ve got yourself a forever sign. They’re easy to travel with, having a banner stand helps them be versatile to use for outdoor markets or corporate events. Your goal is to strategically place posters that expose prospects to your brand, as many times as possible. By seeing a large poster with your messaging, a customer is more likely to remember your business and follow through on your call to action. Posters are great for event promotion, for use in education, or for public service announcements. They should be designed with a large graphic to catch the eye. Once you grab attention with a bold graphic, the viewer is interested enough to read on, and then you can drive them to your digital social channels, website, or landing page. Wide format UV inkjet technology produces stunningly vivid color graphics at large sizes which will get your message noticed. One of the best uses of window clings are to place them on your store window to advertise a big sale. Product images and large fonts combined with bright colors will help draw customers in. Adding sales deadlines or advertising a special just for today will motivate people to act for FOMO (fear of missing out). Listing your website and including a QR code will prompt a customer to engage with your business via their phone as they walk buy. Window clings don’t require any adhesive, they just cling. This is a huge plus if you plan on changing your marketing campaigns regularly. Window clings can be used again and again, year after year. You pay for your window cling, design, and printing once, but can use them for many years thereafter. Read our BLOG to learn more about what we’re planning. Follow us on social media or join our mailing list to get all our latest updates.